I may have missed this post when asking questions before. Is x/2 S-sync functionally any different than normal sync with a RTSS 30 fps cap? It will try and sync to a scanline rather than a time interval, and as such can reduce microstutter, which is important when using enhanced sync. Enhanced sync already has microstutter issues, and using a normal 30FPS RTSS cap will just make it worse. x/2 s-sync should make the microstutter more tolerable. And is there less input lag with S-sync=1 + Fast / Enhanced sync compared to in-game V-sync? It's much lower, at least compared to vsync without any FPS cap. 60FPS uncapped vsync can have 100ms or more of total latency. With s-sync and enhanced sync, you should be getting 60ms or less of total latency. However, you should be able to achieve the same input lag reduction using normal vsync with a "Hz - 0.01" cap. But I haven't tested. But s-sync + enhanced sync has better latency consistency. The -0.01 cap with vsync has the issue of latency oscillation, because the 0.01 cap will result in each frame being synced a bit later every time, so the sync position crawls across the screen from top to bottom, and so latency varies by 16.7ms over time. With s-sync + enhanced sync, this is improved and the latency does not vary as much, depending on how well RTSS can sync to the target scanline. Anyway, that's a bit too much detail to worry about, really. You should simply prefer what feels and looks best to you. If normal vsync with a -0.01 cap feels better to you, use that. If s-sync with enhanced sync looks better, use that. "60 fps: RTSS 60 fps cap + Enhanced / Fast sync* to reduce tearing. 30 fps: RTSS 30 fps cap + in-game V-sync**. 30 fps (old / non-demanding games) : RTSS 30 fps cap + Scanline Sync = -1***"
Would something like this be accurate, or are there better settings for the smoothest picture with the lowest input lag? @RealNC I'll try testing out 30 fps caps some more. So do you think there is an ideal sort of setup for 60 / 30 fps gaming with smooth frametimes, reduced / no tearing, and minimum input lag? The next best solution is scanline sync, if the GPU doesn't get too much load and can't maintain accurate tearline positioning. Other than that, for 30FPS, 1/2 vsync with NVidia cards and a Hz / 2 - 0.01 RTSS cap is the third best choice. But as you can guess it's an NVidia thing. At least I'm not aware of AMD drivers having an option for 1/2 vsync. Sometimes refuses to work though; 1/2 vsync sometimes just doesn't want to apply correctly. Maybe driver bug. 60 fps: RTSS 60 fps cap + Enhanced / Fast sync* to reduce tearing. That always gave me some microstutter. If that's fine with you, then use it of course. I instead was using normal vsync with a Hz - 0.01 RTSS cap, which is perfectly smooth. This will give some microstutter. Cannot be avoided. To get rid of the microstutter, you need 1/2 vsync, which as mentioned above seems to be an NVidia-only setting. There is no such thing as "RTSS 30FPS cap + scanline sync" It's either a 30FPS RTSS cap or scanline sync. Hey this is great information! Was interested in s-sync but as OP wasn't sure how to start using it. Question: is there a limit to the number of invisible scanlines and if so, does the target wrap around back to top of the screen if you set too low a negative value? for best possible performance / tearline invisibility one would set flush to 0 and attempt to target the "lowest" negative scanline (to give "margin of error" for latching inaccuracy / tearline to remain off screen)? and if so, does the target wrap around back to top of the screen if you set too low a negative value? Yes. I think. Although why would you put such a low negative value? To wrap around in this case, you'd have to use -1200. That's way too much. You normally need something between -20 and -150. Performance is not affected by the scanline value. tearline invisibility one would set flush to 0 and attempt to target the "lowest" negative scanline (to give "margin of error" for latching inaccuracy / tearline to remain off screen)? Flush 1 is actually the best setting, if the game uses DX10, DX11 or OpenGL. It stabilizes the tear line better without affecting performance. For DX9, DX12 and Vulkan games, you need choose between flush 0 and 2 (if you use 1, it's treated as 2), and 2 will result in stutter if you don't have enough GPU load headroom. What's the expected behaviour of scanline sync regarding frametimes? Should it be all over the place? Frame times should be exactly the same as a normal cap. If you're on a 60Hz monitor, scanline sync should have exactly the same frame times as a 60FPS cap. If that's not the case, then probably your GPU ran out of headroom for s-sync. I'm having "jumpy" frametimes, no matter the GPU load. HPET was off in the BIOS and it normalized frametimes when I enabled it back while using the usual RTSS framerate cap, but no such luck with s-sync. My setup consists of a monitor with a custom refresh rate of 60.010Hz (I've been using your previous suggestion to great effect for a while now, thanks for that!) and leave in-game caps (if available) at 60 flat. Would the fact that my monitor is using an "odd" refresh rate such as 60.010Hz be affecting s-sync frametimes to some extent or decimal values have no impact on this method? The other method I've tried has been the one suggested here by Chief Blur Buster (tl;dr: fast sync+RTSS framerate cap+in-game vsync), but since I can't seem to be able to make an account in that forum, maybe you have an answer: does Maximum pre-rendered frames have any impact on this? You can't have fast sync + vsync. It's one or the other. I don't think MPRF affects any of this. Does the SyncFlush setting have any effect when using s-sync in conjunction with fast sync? What causes that sometimes you get a reading of 60fps and 33.333ms frametimes? Been running the nvidia gsync demo just to test s-sync, since it's a low GPU load scenario (~19%), yet I get these jumps in frametimes between 16.67 and 33.33ms. 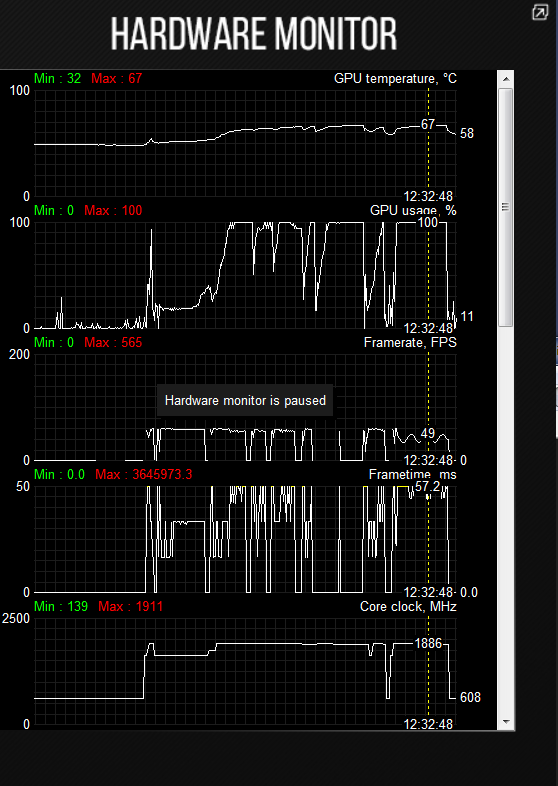 Also, when the framerate drops to 58fps, frametimes go straight to 33.33ms, instead of the expected 17.24ms. 57.2ms for 49fps and the GPU load is through the roof, SyncFlush was 0 in this case. Not seen: CPU usage is 9%. And finally, there's a stat that reads "Sync calibration" in the OSD when you enable the "Show own statistics" setting in RTSS, any idea what it does? Just curious, since I haven't seen it mentioned in the main RTSS beta forum thread. Sorry to bombard you with all these questions, appreciate the time you take to answer them. I don't know the answers If you get stutters even with low GPU load, I don't know why that is or how to fix it. I also don't know what sync calibration does. I am going to write a Scanline Sync tutorial in the near future. However, I can only write so much at once. Hope Guru3D doesn't mind when I ask (because it brings more publicity to Guru3D and RTSS!) but I'm also recruiting a guest writer for Blur Busters on freelance basis for an RTSS Scanline Sync article. Reimbursed. Are any one of you willing to write an RTSS Scanline Sync tutorial? Send me a message. Recalibrate your tearline upwards. Bigger negative offsets. 2. Calibrate scanline sync (via keyboard shortcut) until you've got a vibrating tearline that NEVER goes below the bottom edge of the screen. 4. You'll see it stay more consistently at 16.67ms. In VSYNC OFF, if the "tearline" goes below the bottom edge of the screen, that's the sudden 33ms frametimes if you were using Fast Sync -- because that's a missed VSYNC. That's why if I recommend if you combine RTSS Scanline Sync with NVIDIA Fast Sync -- you must calibrate tearline position to the point where it permanently stays above the bottom edge of the screen. If it vibrates crazily, raise the tearline higher (bigger negative scanline offset). So that tearlines never, never, never touches the blanking interval (except during rare framerate dips). You want to get tearlines as close as possible to bottom edge of screen, but never reaching the blanking interval (A.K.A. tearline occasionally going below bottom edge of screen). The ideal calibration will vary from game to game. If you need a universal calibration, have a generous offset (e.g. 25% earlier). That said, 25% earlier means 1/4th more frame lag (e.g. 4ms lag at 60Hz) but it can be pretty much is solid in most games. The bigger the safety margin, the less likely you get lag spikes. You can use large positive scanline offsets but negative scanline offsets are vertical-resolution-independent (and more friendly to lag-reduction tricks via Large Vertical Totals / Quick Frame Transport (QFT) tricks). That's how you can get low-lag perfect refresh-rate-synchronized Fast Sync -- keeping tearline above bottom edge of screen. Strafe left/right in a game with vertical wall edges, to look for tearline positions. Use the RTSS hotkeys to calibrate tearline position. Calibration & Tuning Mantra: Always calibrate RTSS Scanline Sync using VSYNC OFF first before turning VSYNC ON / Enhanced Sync / NVIDIA Fast Sync! Occasional framerate dips: In practice, it is okay if there's occasional framerate dips -- such as disk access -- e.g. you're able to sustain full framerate matching refresh rate 90%+ to 95%+ of the time, so just aim for the 90th or 95th percentile of permanence. For emulators or older games, it's easy to aim at the 99th+ percentile though, but for newer games, just merely getting 90th percentile can sometimes be hard. A stutter will be a visual indicator of a lag spike, so if you're getting stutters during competitive-critical gameplay, then you definitely want to calibrate for framerate permanence above that, to improve aiming during critical heated moments. You might not be able to do anything about those disk access stutters, but at least you've calibrated for your critical moments. - Do not bother with below trick doing this unless you're a CRU Wizard. - Do not bother with below trick unless you know your monitor supports ultralarge blanking intervals larger than the vertical resolution, such as "Vertical Total 2200" for 1080p. - Do not bother with below trick if you don't understand "Vertical Total" or "Front Porch" or "Back Porch" or "Horizontal Scan Rate". - QFT behavior is already built into VRR, so use VRR instead. It's easier to use GSYNC or FreeSync as a much easier QFT method (e.g. 60fps cap at 240Hz) since the VRR provides a very easy natural QFT mechanism. That's why lag is very low on GSYNC/FreeSync since all refresh cycles (no matter the current Hz=fps) are always delivered at max-Hz velocity. Very few monitors support large VBIs at their maximum non-VRR refresh rate. However, a few of them do -- e.g. delivering a 60Hz refresh cycle in 1/120sec on a monitor that doesn't support 120Hz. (This is rare, but occasionally happens). Alternatively, if you're using large blanking intervals to reduce strobe crosstalk (squeezing LCD GtG into VBI to reduce artifacts with a blur reduction backlight) -- then it may be more favourable to use VSYNC OFF and adjust scan line sync late into VBI. This creates a "Quick Frame Transport" effect. Normally, Microsoft and graphics drivers does frame presentation at end of refresh cycle (bottom edge of screen), rather than beginning of refresh cycle (top edge of screen). By delaying input reads-render-present late into a superlarge VBI, via RTSS scanline frame rate capping late into VBI (small negative offsets), one can reduce lag further thanks to the Quick Frame Transport effect of the use of an ultralarge blanking interval (Example: 60Hz refresh cycles transmitted over the cable in 1/120sec via the use of an ultralarge VBI the same size of the visible image). Quick Frame Transport (QFT) is part of the HDMI 2.1 specification but is possible to DIY on any cable with Custom Resolution + Large VBI + RTSS scanline sync. Displays that are intentionally designed to support QFT works best with this trick, but I've run into some displays that have undocumented QFT capability on one of its inputs, e.g. certain 60Hz HDTVs that supports 120Hz input but the panel can't support 120Hz. (Basically frameskips, as in only displays 60 frames out of 120 per second); those displays can often be tricked into a QFT 60Hz signal (via ultralarge VBI -- maintaining same exact 135KHz horizontal scanrate but halving the vertical refresh rate from 120Hz to 60Hz) -- that speeds up delivery of 60Hz refresh cycles to 1/120sec -- reducing frame delivery latency by 8ms. If you shift your inputread-render-deliver pipeline to align with the frame transmission (presenting framebuffer very late in VBI, right on time for visible frame transmission), that reduces the input lag of VSYNC ON / Fast Sync / Enhanced Sync by 8ms without raising refresh rate on displays that supports a 2x QFT acceleration factor (documented or undocumented). First, play with custom resolutions until you've got the biggest supernova-sized galactic-sized blanking interval your monitor will sync to -- a blanking interval big enough to drive a battlecruiser through. Next, start your game, make sure it's correctly using that hacked custom frankenstein signal timings & resolution you created, THEN finally calibrate RTSS until your tearline shows up near top edge of screen, THEN calibrate it until it barely disappears above top edge. Now you've created a fixed-Hz QFT sync mode! After some testing on my 1440p 60Hz VA crap from BenQ I must say that this is indeed incredible. Practically all my older games can be set to use this new scanline sync method with no input lag and no tearing. I used the low input lag method before (VSync + frame limiter 0.01 bellow refresh), but this is just better. It works wonders for old OGL titles like Doom3, Q3A, Quake4, Prey, RTCW and many others old DX/OGL games with tragic VSync/buffering implementation. The last one is somehow important on my setup. Don't know if anyone mentioned it, but with power management adaptive/optimal the tearline position was unstable - I think because the frequent GPU power state changes with undemanding games. With max. performance mode and stable power state the tearline is invisible pretty much all the time. So thanks to everybody who participated on this feature and especially to Unwinder for implementing it into rtss. So is there a way to hide this two linetear? I don't think so. The second scanline cannot be configured in the RTSS UI, you need to edit the profile file. But even then, you can't hide both tear lines. If they're too close together, there's no time left to render the frame. You should probably use fast sync (nvidia) or enhanced sync (amd.) I'm not sure myself what the use of 2x scanline sync actually is. The intention doesn't seem to be the elimination of tearing. I agree, the two tearline are to close. I gonna try with fast sync yes, thanks. hey im back again, ive got a strange problem, i just buy insurgency sandstorm, vsync off no frame limit, i use scanline method as usual, set to -60.